Sean with "The Book of Love"
After making the full circle from drawing to sculpture, Sean is back to drawing. It began anew with his recent drawings featuring positive messages. He has even completed his first book based on these drawings, THE BOOK OF LOVE, both a children's and grown-up's story written and illustrated by Sean and inspired by his recent marriage to his lovely Hungarian wife, who is also an artist, and who helps Sean in his many art projects. In the meantime, Sean is actively creating. 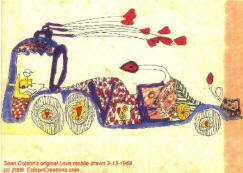 Look for more unique products from this series, from a "Kiss Mobile" to a new illustrated "Love Clock"! Sean continues to push positive messages in his art. 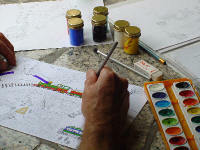 Currently, his work can be found in many well known stores and retail outlets, as well as the occasional art exhibition. And he's always featured on the web. SEAN COLSON began his drawing of cars and people in the early '60's. At the age of five he was selling his drawings in his front yard for a nickel each, using the profits to buy the latest Matchbox car to add to his collection, and, of course, to draw it. By age nine he had a large portfolio of works resulting from constantly drawing during class time. He had his first exhibition of these works at the Hilton Leech Gallery in Sarasota, Florida in collaboration with his father, sculptor Frank Colson. The exhibit featured drawings of cars and people, animated by a hand-cranked movie machine his father constructed. To the viewer's delight, the charming car drawings zoomed by on the screen as the crank was turned. 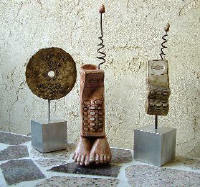 Later, Sean evolved to making sculptures in clay and bronze, creating whimsical figures from "clay gingerbread" styled after medieval knights, to cowboys riding dolphins; from whales morphing into jets to modern day cell-phone sculptures personified as "Phone Pets". Various Bronzes. Click to Enlarge!